Calpe as you can see on the regional map below, lies in between Benidorm and Altea to the south and Benissa and Moraira to the north directly on the Costa Blanca coastline. Famous for its roman archeological findings and fabulous rock landmark the Penon de lfach, Calpe hosts thousands of tourists each summer. By using the slider top left you can magnify certain areas of Calpe on the map. 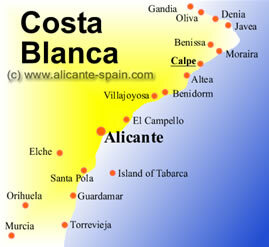 Below a extensive list showing how far Calpe is from major cities in Spain. All data is given in straight line distance, so driving distance by car or train may me significantly longer. In additional we put together a short video about Calpe here and detailed Calpe sightseeing and tourist information here.